Christians in Context: from orthodoxy to orthopraxy. : If A Picture Paints A Thousand Words, Then Why Can't I Paint Jesus? If A Picture Paints A Thousand Words, Then Why Can't I Paint Jesus? So I had my discipleship group of four adorable and brilliant sixth graders over for dinner awhile ago. We enjoyed Kraft Macaroni and Cheese (I ate some leftovers directly out of the pot and one of the girls informed me that eating dinner directly out of the pot is what "young people with careers" normally do) and sampled Sticky Toffee Pudding ice cream, which we awarded a respectable 8 out of 10 (we rate a new ice cream each Thursday), before settling into our weekly theological discussion. So far, these girls have asked how Jesus can be eternal if He died on the cross, wrestled with the problem of evil, shared how the Spirit is helping them say no to sin, and posited that Jesus may have had colic as a baby because smart babies sometimes have colic. Thursday's discussion was predictably thoughtful and lively and one of the girls asked a great question: How did we get different races if everyone came from Adam and Eve and Adam and Eve were white? This got me thinking about children's Bibles and if they might do more harm than good. My bright little sixth grader has probably thought that Adam and Eve were white for a long time. I doubt anyone actually taught her this, but those pictures in children's Bibles made a lasting impression and she assumed that Adam and Eve looked like the picture in her Bible. Since we don't know what Esther, Moses, or Jesus really looked like (except that they probably weren't the chestnut brown haired Europeans pictured in many Bibles), is it all right to put false images into the minds of kids? And then there's the issue of drawing the Son of God. Even though people have been painting Jesus for centuries, there's something about this that makes me uncomfortable. No painting, picture or sculpture can accurately present what Jesus really looked like and I'm concerned that so many kids picture the Son of God as a handsome and very clean guy with long flowing hair and a red sash. Jesus’ body is a crucial part of who He is. If we can’t demonstrate what Jesus really looked like, should we even try? As a director of children's ministries, I'm starting to dig myself into a hole. We use a children's Bible in our preschool class every week and if I really believe what I just wrote, I need to start thinking about some storytelling alternatives that will present the Bible accurately and keep in mind our preschoolers' two second attention span. One idea I'm tossing around is using pictures of objects to tell the story instead of pictures of people. For instance, if a teacher is telling the kids about Jesus feeding the five thousand, he might show them pictures of fish, loaves, and baskets (or better yet, show the kids real fish and bread) instead of showing a picture of Jesus with the fish and loaves. 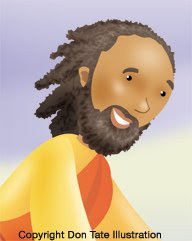 I think the lack of pictures may allow the kids to develop a more biblical conception of Jesus. What do you think? Should children's Bibles be outlawed? Should I be fired for even suggesting such a thing? Is there a way to pictorially represent the people of the Bible in an accurate and helpful manner? I'd love to hear your opinions and ideas. As a recent Father (8-months) and one of the Children's Ministry Teachers in our church, I have to think about these very issues myself. To answer your direct question, NO, we do not need to ban children's bibles but we do need to look closely at which one's we use and how they teach (or not teach) the gospel. There are a couple of suggestions I've read but the problems I've seen (besides white Jesus) is that many children's bibles fail to point to Christ in their stories. They are mainly focused on morality lessons or history lessons. Of course, Explaining the Gospel becomes our jobs as parents so maybe it's not an issue - so long as we remember to explain it better. I feel your conflict. I grew up with a children's Bible myself, and I do still picture Jesus, Paul & others in my head as they were portrayed in that Bible. But on a positive note, it also did help me understand that these were real people, who really existed. Gave them a concreteness of sorts. I think using no pictures at all could potentially move to far to the other side - that Christianity is all just symbolic morality tales, not concrete, real stuff of dirt & clay, water, bread & wine. I think the best solution is what you are doing - use pictures, but also talk with them (as they can understand) about the limitations of such portrayals. Square Peg, you hit on my greatest concern for removing children's Bibles altogether - that kids won't have an accurate conception of Jesus' humanity. Even though children's Bibles have some problems, maybe it's better to use them (and add thoughtful commentary along the way) than risk kids misunderstanding the incarnation. Archshrk - solid recommendations, thanks for posting them! Another one I like is "The Praise Bible: 52Stories For Enjoying God's Goodness And Greatness" by Mack Thomas. Each story ends with a "My praise to God" section, which is a prayer responding to an attribute of God revealed in the story. It's not perfect, but definitely one of the better resources I've seen.